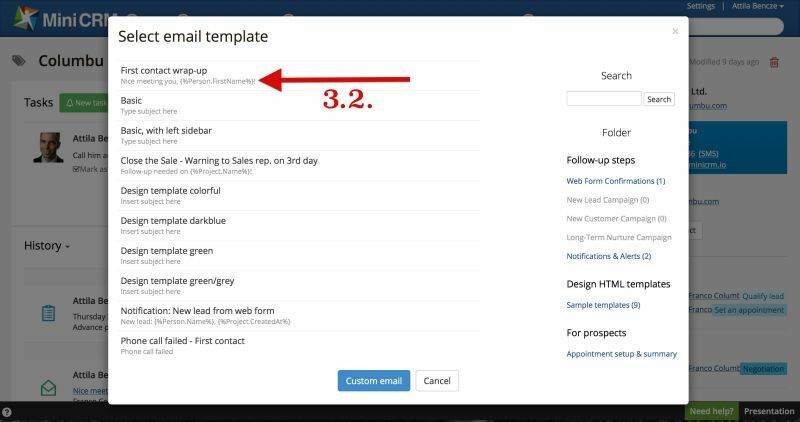 In MiniCRM you can send mass emails, and emails by using templates or set an automatic follow-up. 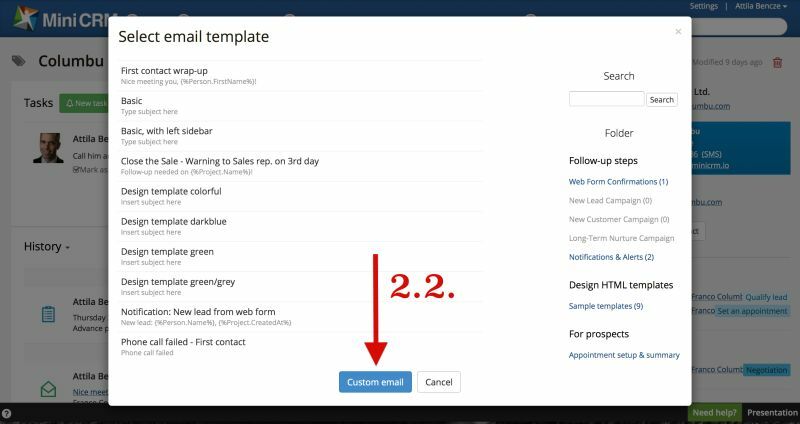 To send a custom email to a contact, click on a Contact Person’s email address [2.1.]. You can edit your message by clicking on [Custom email] [2.2.] or you can choose a saved email template. Default sender is the user currently logged in. 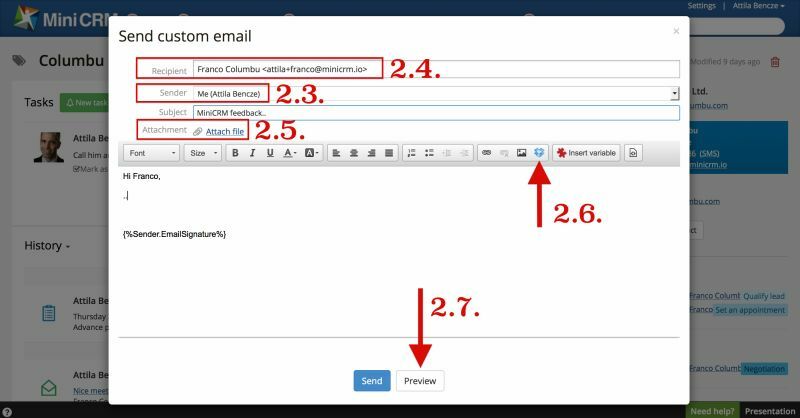 You can also set the central email address as sender, which can be added to all Modules at Settings > Modules [2.3.]. Default recipient is the contact (business or person) whose email you have clicked. You can add more recipients manually, who can be another contact persons or other active MiniCRM users [2.4.]. If you use any Variables, the originally selected recipient’s and card’s contact info will be used by MiniCRM. Additional recipients only receive a copy of the email. To attach a file, click on Attach file [2.5.]. If the file size is too large, click on Insert file from Dropbox [2.6.] and include a public link in the message. By clicking on [Preview] [2.7.] 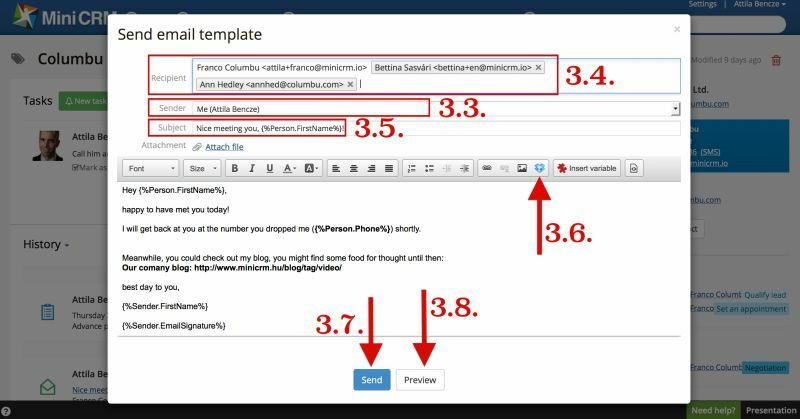 you can check the final layout of your email before sending. 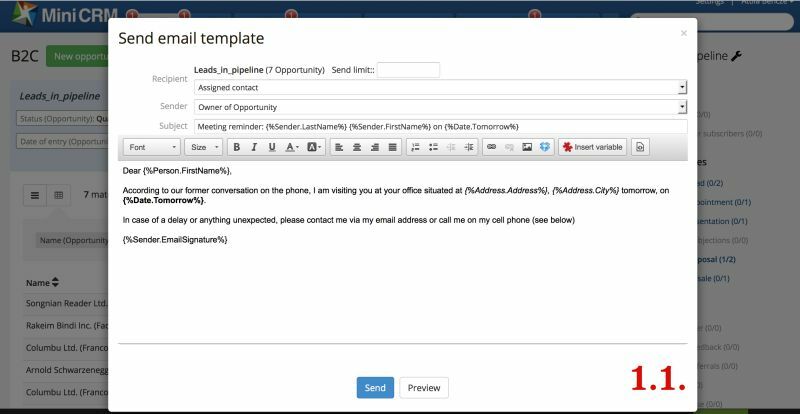 To send an email by using a template, click on an email address on the selected client’s card [3.1.]. All templates are listed in the popup window that can be found within the selected module. You can search among templates by using the Search field. To select one, click on its name [3.2.]. Default sender is the user currently logged in. You can also set the central email address as sender, which can be added to all Modules at Settings > Modules [3.3]. Default recipient is the contact (business or person) whose email you have clicked. You can add more recipients manually who can be another contact persons or other active MiniCRM users [3.4.]. If you use any Variables, the originally selected recipient’s and card’s contact info will be used by MiniCRM. Additional recipients only receive a copy of the email. Before sending, you can change the content and subject of the template. The original one won’t be affected by these changes. So you can use the template later. To attach a file, click on Attach file [3.5.]. If the file size is too large, click on Insert file from Dropbox [3.6.] and include a public link in the message. By clicking on [Preview] [3.7.] you can check the final layout of your email before sending. The inserted variables are also displayed. To send the message, click on [Send] [3.8.]. It will be displayed in History.